Presented by Dr. Laurel Wentz and Justin Simmons of East Carolina University. Here are the questions that we did not have time for at the end of the webinar. I will invite Dr. Wentz and Justin to reply to them here. Just to clarify, you used the ISAK front thigh skinfold site for landmarking where to place the monitor, correct? So this would be a bit more over the rectus femoris, rather than vastus lateralis...did you do some experimenting to see if there was a difference in data depending on the muscle in quad focused on? Was doing the intervals right after the VO2 max test a possible limiter in seeing lower smO2 levels in the interval efforts? Was there any relation between the VO2 amplitudes and for the people and the amplitude for the SmO2 drops? Most studies are using NIRS on the vastus lateralis in cycling, why choosing the ISAK skinfold site? I'll add some additional comments on the question of the Moxy data dropouts on the left leg and the differences between the left leg and right leg. There can be several causes of the reading dropouts. 1) The sensor does not remain in contact with the skin. This shows up as missing data when the exercise turns more vigorous. In this case, we also usually see wildly varying readings which we didn't see in the data here. Here's a video that shows a very robust was to attach the sensor with the CoverRoll Stetch tape. 2) The ambient light interferes with the readings. This usually isn't a problem indoors, but it can be if you have incandescent lights or are near a window. This shows up as missing data and may or may not be accompanied by wildly varying readings. This can also be motion sensitive. The ambient light rejection algorithm can reject a lot of ambient light if it's steady, but if it varies rapidly as can happen with motion, it stops the sensor from trying to take a reading. If you are seeing this issue indoors, a pair of shorts or fabric over the sensor usually takes care of it. If you are in direct sunlight, fabrics are often not opaque enough and you should use the Moxy light shield or something like it. 3) The ANT+ signal might be interrupted. In this case, the data will be missing in the PeriPedal or PerfPro data file, but it will be present in the data downloaded from the sensor. Sometimes the ANT+ dongle has problems when it is plugged directly into the PC. Often a USB extension cable to get the dongle close to the sensors and away from the noise sources of the PC completely eliminates this problem. 4) We sometimes see missing data when it's downloaded from the sensor. This is less common. This will show up as 1 or 2 missing blocks of data in the .csv file and if you download the data a second time without clearing, the missing data will be there. If you collect the data with PeriPedal, PerfPro, or some other software, then this is not relevant. 5) Sensor placement. Sometimes if the sensor is not placed over a homogenous muscle, we will see dropouts. If there's not enough muscle or if the sensor loses contact with the skin due tot he movement of the athlete, it can cause problems. This typically isn't an issue on quads or calves, but can be if you get close to the knee or if you are trying to get on a small muscle in the arm or back. This is not a common problem and it's resolved by getting the sensor centered on the belly of the muscle. Let me know if you are having problems with data dropouts like this and I can work with your to get them solved. We can generally take readings continuously with 0 dropouts even during the most vigorous exercise. On the left vs right difference issue, we have done many tests on this where we test and swap sensors and test again and it's always been a real physiologic difference rather than a sensor difference. When we've done sensor to sensor comparisons, they read the same within less than 1 %SmO2. Of course, I never want to discourage validating this on your own and if you find something different, I'd want to know about it. Super great info and I will use it for my high school student to show a lot of interesting questions. Lactic acid , Resting lactate, Use lactate as a sign of a " successful intensity in a VO2 max test ? Placement of MOXY in cycling in top versus okay athletes VL versus rectus. 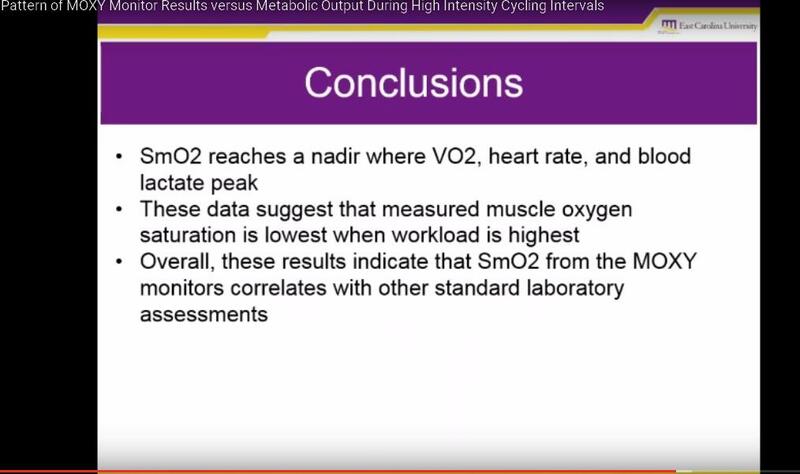 Statement that Lactate VO2 HR and SmO2 "peak " at teh same time. For the latter I need if possible the CSV files from No 96 if that is possible. If you do not like to sent it on here can you email me that csv file and if you used Peripedal better would be that section as we have HR on that one much better. .And if possible do we have the VO2 data with RF , TV and CO2 at the moment of the end of the full load and the post load reaction of the CO2 and TV and RF. ? Interesting study and lot's of great questions , when we look established ideas on VO2 and lactate and than give it a closer thought. Thanks so much for sharing this with all of us. I can get some feedback from our small discussions on here or I can keep it just on a mail for the research group or I can just use it for us. What ever you think may be fun. Here just for fun. Can you see that 2 of the 6 where already above " LT " of 4 mmol so they where already anaerobic before they started out ? I assume you did 2 - 3 readings in the cases where you had this high resting lactate to confirm ? I will be back with one big point and some explanation. The conclusion that the NADIR of SmO2 and lactate and HR and VO2 are at the same point throws everything I did over the last 30 years over board. What is possible and would force me to rethink and reevaluate many many tests and case studies, which by he way has happen many times already.
. The reason why we actually love NIRS is, that during my education we where able to assess metabolic reactions +-30 seconds accurate and therefor we learned the interesting idea of ATP first followed by CP and so on. Today where we have tools and one of them is NIRS, we can go on much smaller time intervals and see, that what we thought is happening does not happen at all. 1. Lactate and low SmO2. What is the lag time of the full lactate reading we can read it after an all out 30 second load. What where the lactate readings after the 30 s seconds at the end of the load by 30 seconds after the load, 1 min after load and so on. We id a steady flow lactate testing over 20 years back with Dr. W Sanders and Dr. Gavin Smart in Quesnel and had very seldom a peak lactate after the 30 second all out load. In fact in many cases the peak showed up much later. It could be as well not high at all as 30 seconds is a critical time depending on the athlete. Will show some big studies where post all out lactate was tested after 300 m and 600 m all out. This asks the question. Is lactate peak where we have the lowest SmO2. And is lactate actually available in any case, where we have a very low SmO2. Result. If your study is true than we have tho rethink to use lactate or SmO2 as a load feedback for saturation of load and recovery of load. HR. What was the HR really after the 30 seconds and if the HR reacted is it relevant to he CO alone. When we looked at HIIT many years back and as well combined NIRS ( Portamon) with VO2 and HR and physio flow we had in some cases a higher HR before the lowest SmO2 at the lowest SmO2 and after the lowest SmO2 ?? ( depending on what all out meant). When we look than we knwo HR is a small window to the cardiac hemodynamic. So HR may not show what happens and depending n the athletes hemodynamic reaction we have all three options. It depends on EF % LVET, SVR depending n BP control and so on. So again. Conclusion HR is at the top when SmO2 is on the lowest level has to be carefully reviewed and again let's look at your datas you for sure collected before you made this conclusion on CO Ef % and so on. Next up SmO2 lowest, when VO2 highest ? First if we can look closer at the Time VO2 information e will sees whether there is not a delay of VO2 information from SmO2 information due to the technology and the way you assess VO2 at a mouth level and SmO2 at a muscular level. Depending n the VO2 equipment ( Mouth breathing of nose mouth breathing you have a different peak situation different VO2 peak results ) Looking at your 96 athlete just in the overall view it seems to me VO2 peak i delayed and different.? Need to look at one load at the time. This leads us to the last Nadir Load is highest when SmO2 is lowest. I have to dig back but we showed on the forum some case studies done with Mary Ann in palm Springs, where the load was long over and SmO2 kept dropping. Why would we see that.? So in your datas with VO2 we have a great chance to see this in all 6 cases. What we need is the raw CO2 datas and the timing together with SmO2. This will lead us into the respiratory question and finally to the O diss curve reaction. Depending in the athlete ability to get rid of CO2 as a part of the H + buffering or not we have an ongoing drop in SmO2 after the load till we have a balanced O2 disscurve. Or in other words if the athlete got hypercapnic, SmO2 will drop after the load so lowest SmO2 is NOT where we have the highest load but after. In some cases we can even create the opposite and SmO2 will stop dropping and even goes up despite a higher load so by peak load we may have a higher SmO2 level. than by a lower load. Summary . I may be very wrong than I have to go back, but I would first like to see the raw datas whether this is really the case. SmO2 lowest or Nadir when HR . Lactate VO and work load is highest. If that is the case NIRS looses the benefit we like to have ( live feedback with no time delay ). Thanks again and yes would be fun to have a closer look at least the No 96 athlete . Will be back with questions in cycling as a good idea as well as VO2 max and lactate as a good combination for info on all out ? Here the summary , why I would love to see the raw data. I am surprised that the SmO2 levels were not lower @ max effort for the cyclist.